The narrow trail winds around cliffs above a jungle of tangled trees in the clouds. 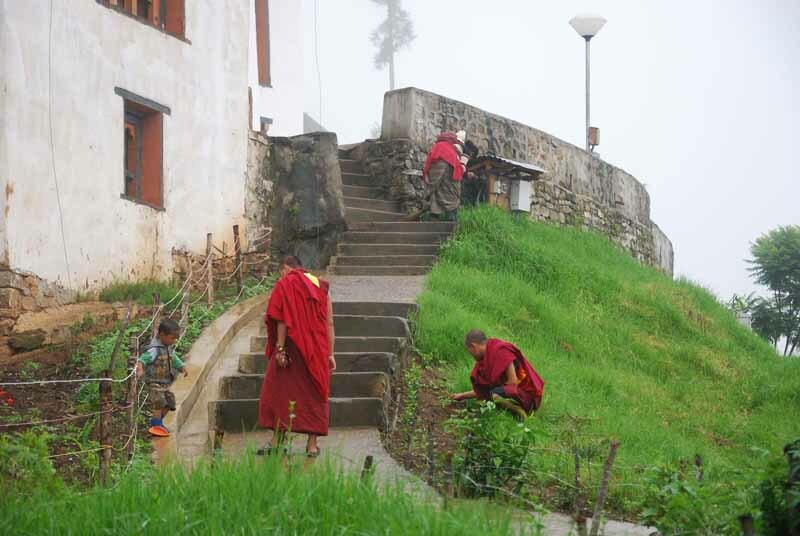 After a steep climb several buildings of an ancient temple emerge from the mist. Suddenly a demon appears from the jungle, transforms itself into a dog and attacks, mistaking me for an enemy warrior and biting me in the leg. Fortunately a rimpoche comes to the rescue, subdues the demon turning it into a trusted ally and protector of the temple, to be known as Mindu, the Boss. 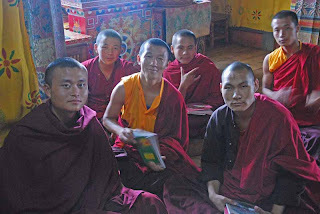 The rimpoche welcomes me to the monastery and introduces dozens of eager monks who are to become my students over the next week. 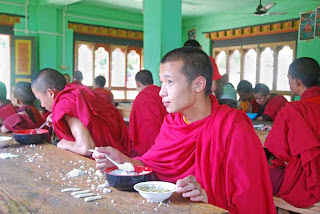 We live in cramped quarters, eat rice and vegetables in the canteen, study English, attend pujas and participate in debating Buddhist philosophy. 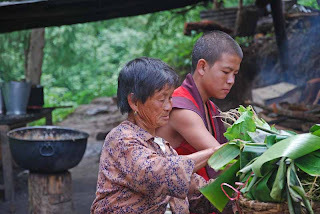 The life of a monk is difficult, food and housing are simple, study hours are long, the daily work is hard and wake-up time is 4:30am. Breakfast is prepared in a shack, a make-shift kitchen with a metal roof and no walls, where the cook is boiling a large pot of water over the smoky wood fire. A cobweb hangs from the corner of the roof, containing raindrops and hundreds of tiny flies caught in the past days. A small kid runs by, salutes and shouts Good Morning with a wide smile, on his way to morning prayers. Behind him rises a green vertical carpet of rainforest covering a cliff that drops to the river canyon with a series of cascades. The cook's wife sweeps the broken concrete stairs with a twig broom, baby securely strapped to her back with a colorful cloth, while 3 year old son plays football in the rain with a punctured plastic ball. 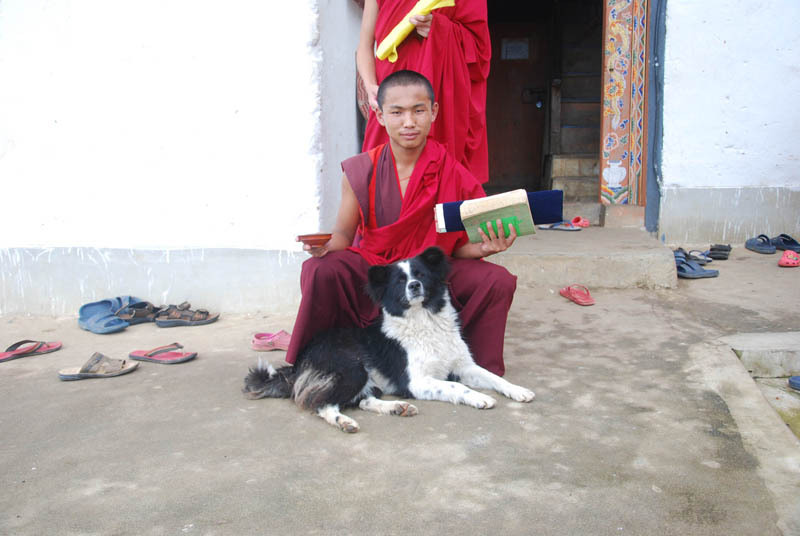 A black hairy dog chases pigeons that peck away at the leftover rice spread by monks on the concrete slabs. 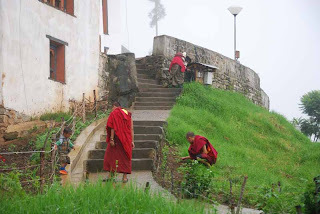 Lhobey Tindu tends to his garden, planting cucumber seeds among the roses and tomato plants, while several smiling monks look on from the porch above, taking a break from a day-long puja sponsored by a local merchant to pray for all sentient beings. 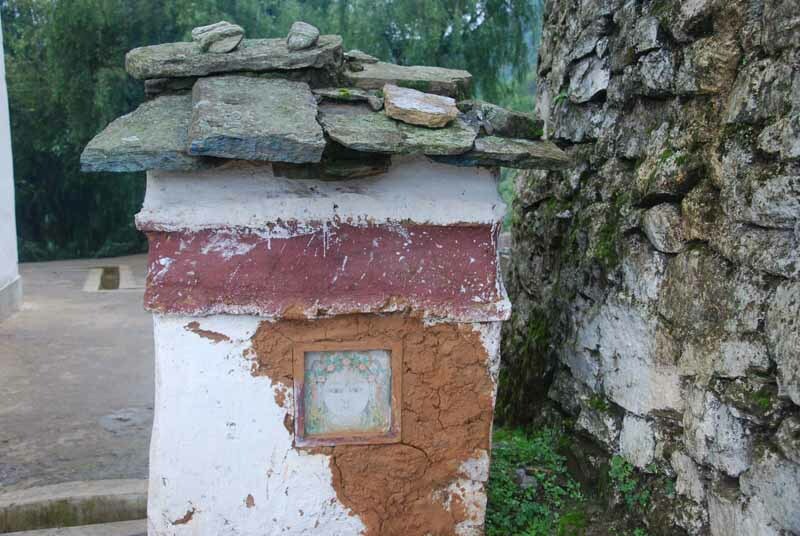 An age-old crumbling chorten guards the timeless silence of the imposing temple, built by Guru Rimpoche hundreds of years ago. Suddenly the silence is broken by the ringing of a temple bell, calling all to prayers, followed by three dogs howling in a wailing tone. 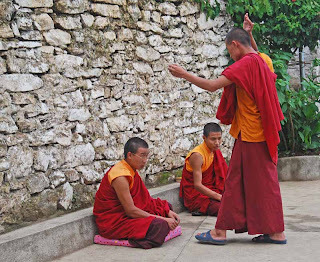 The afternoon prayer begins, with the beating of drums and the booming sound of Tibetan horns, punctuated by the periodic blowing of conch shells. 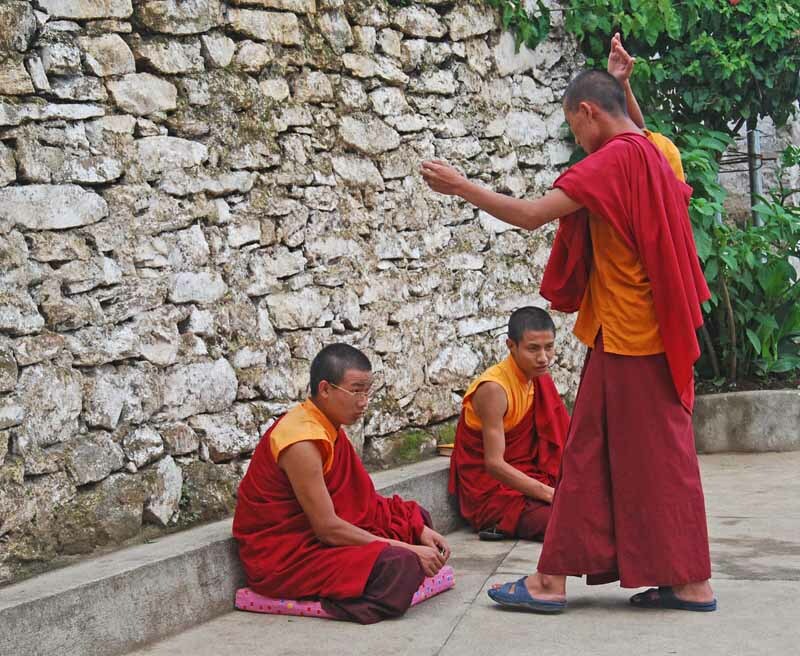 In the evening we hold English class for the novices. 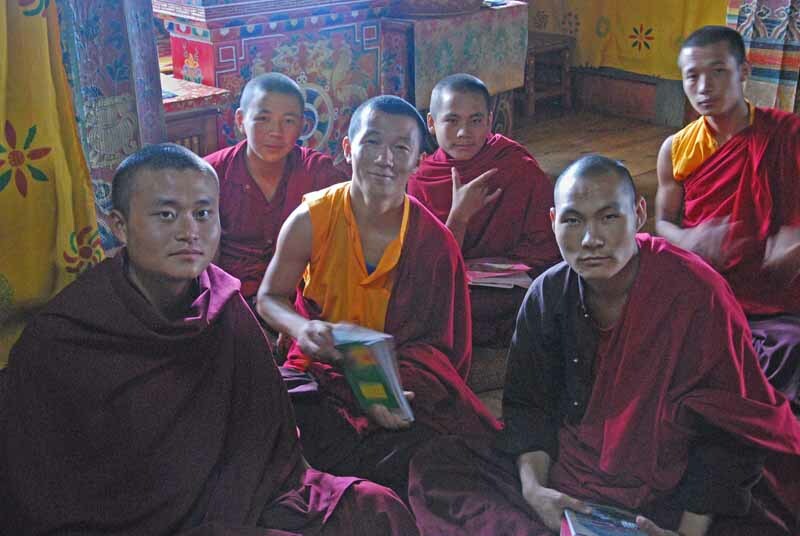 They sit on the temple floor, attentively taking notes from the board on vocabulary and grammar. Then we decide to practice some simple songs and they offer some Nepali and Dzongka songs and dance for my entertainment. 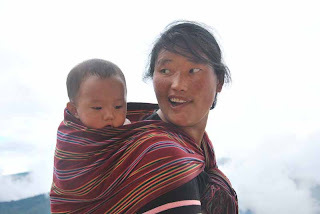 We finish class at 8pm then go to the canteen to watch the movie Ta-Gu-Bu, a 1000 year old story of a young boy who became a lama after building a great temple, meditated in a cave and then learned of his mother's tragic death in a dream. Next morning I hear some excited voices coming past the kitchen. Some of the novices are running towards the toilet. I follow them to investigate. A monk is holding a snake on a stick, it was beaten with sticks and stones and is now ready to surrender. The boy takes it with caution and drops it over the ravine into the creek below. It is a poisonous snake, they tell me. I survey the jungle that surrounds us, it is home to monkeys, bears, snakes and leopards. We have a small pet monkey living in a house nearby and the boys tell me about the leopard they sighted several times in the forest and near the toilets. 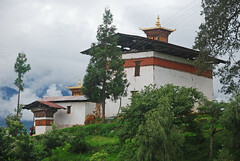 After a week of living at the monastery, taking part in every phase of life, walking the jungle trails to villages and temples on the mountain, meeting friendly villagers and enjoying the breathtaking, heartbreaking scenery on every step, I became transformed by the ultimate peaceful existence on this remote mountain, undisturbed by external influence. 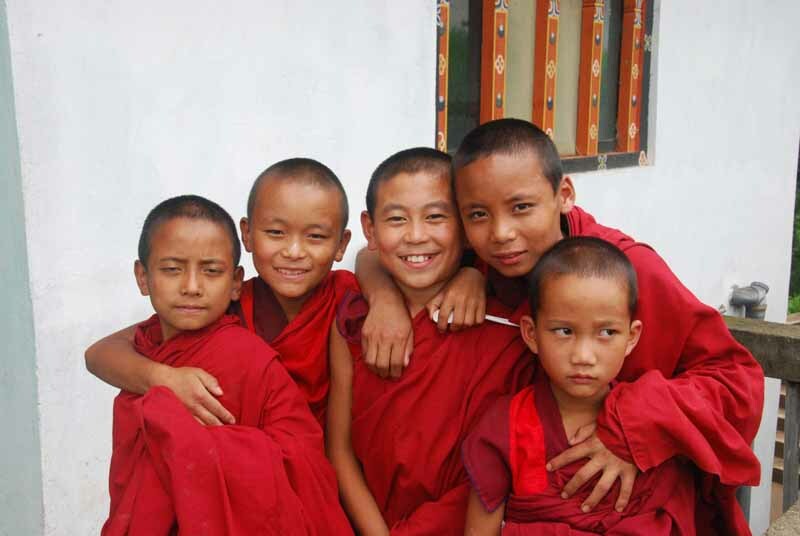 The young monks bid me farewell, urging me to return soon, as they found "Sir's teaching very nice". I hugged them and promised to return during my next vacation, for I greatly miss their kindness and lovely smiles. For a while I lingered round them, among the chortens and prayer flags, listened to the soft wind breathing through the grass, watched the mist lifting to reveal the distant peaks with soft clouds hugging the hillsides, and wondered how anyone could ever imagine a more peaceful spot on this troubled earth. 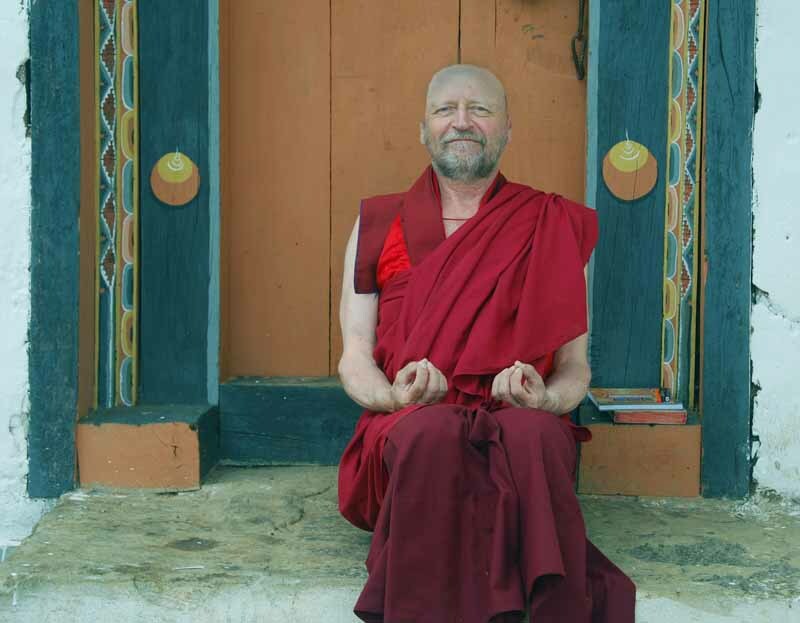 My dog bite has healed and I continued my 1000km journey through the remote mountains of Bhutan, returning safely to work, thanks to the guidance of Guru Rimpoche and the help of my dear friends and students in all parts of this welcoming Himalayan Kingdom. Reading this i felt i was part of your Adventure. You make things beautiful. Carry on with your Adventures and good works. Thank you bro, I really enjoyed my stay at Nalanda. I am now busy on a bike trip with students to raise funds for disabled kids. 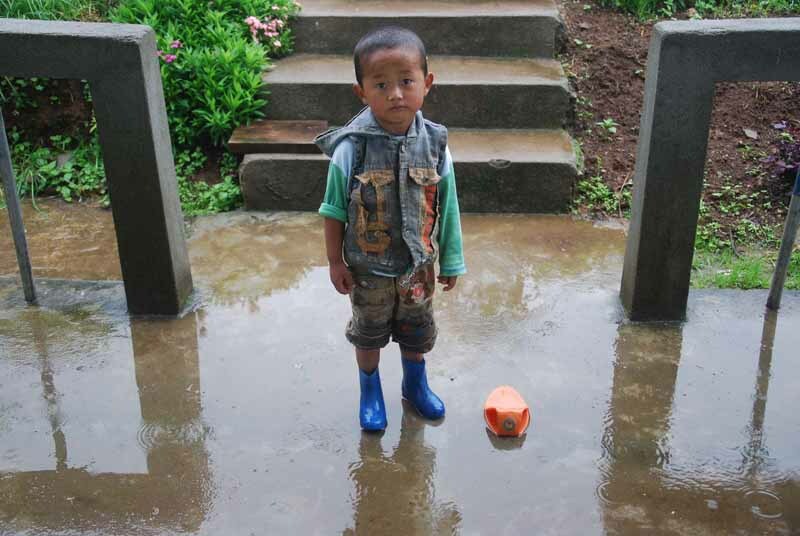 We are in Paro and Thimphu and area collecting donations. We are overwhelmed with the generosity of all the people. In your writing, I was there with you. I yearn for the beautiful, spirit-filled silence. Best, Gretchen. Thank you Gretchen, hope you are enjoying life back home, we miss you here! Istvan - I agree with Gretchen, wow you have a powerful writing style that evokes so many wonderful feelings. Now all the facebook pictures make sense - Sheila, Aaron and I thought you gave up statistic to become a monk (lol LoL LOL) -- you will always be Rinpoche Istvan to us!! Thanks Doc David, I learned a lot of things about writing while hiking with Dr. Gretchen, so I tried to implement some of those ideas in this story.